Joe's Creek was formally known as Timberbrook and consists of about 985 residences. The southeast quadrant includes a community of duplexes which have no through streets into the rest of the neighborhood. 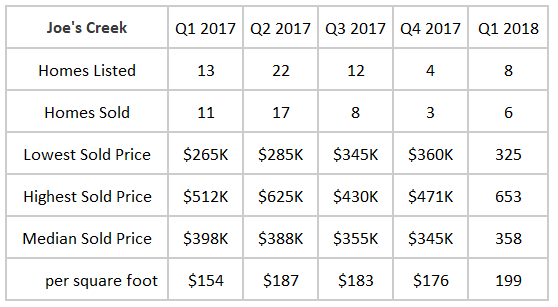 This chart lists the raw numbers of home listed and sold in the neighborhood with the median price and price median per square foot.